The one real problem that there is with leather crafting is that you can't make any mistakes. All it takes is one stitch in the wrong spot and you've got a worthless material sitting in front of you. That's because when you make a stitch in leather, you're creating a permanent hole in the product! You can't even use pins when plotting out your project because of this fact. Leather also tends to stick to the presser foot or the throat plate of most standard sewing machines. Although you can sometimes get away with putting a piece of scotch tape over the bottom of the foot, most machines aren't going to accept the thickness of the material. The leather will either stick underneath the foot or you'll just get a stuck needle that has created a problematic permanent hole. I have leather workshop for hand made leather belts, leather bags, phone cases, leather gun holster and leather accessories. I stitch leather by hand, and I am looking for a proper leather sewing machine. What would you recommend to me, CB3200, CB3500 or CB4500? The CB4500 is good all around machine for sewing the heaviest of leather projects. 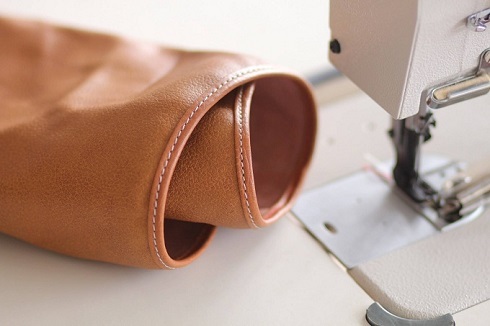 The machine will sew 3/4 inch thick heavy leather with ease. The long arm length of the CB4500 makes it the preferred choice by professionals because the long arm adds to the capability of the machine. The CB3500 is the shorter arm version of the CB4500. The machines are the same except for the shorter arm length. The CB3500 is an ideal machine for those that will only sew smaller leather goods such as knife sheaths and gun holsters. The CB3200 is an ideal machine for the hobbyist or the person who requires a heavy duty compound feed machine on a budget. The CB3200 is the lowest cost heavy duty compound feed saddle and Harness stitcher in the market today. It has a maximum sewable thickness of 1/2-5/8 thick depending on the type of leather being sewn. The 10.5 inch arm length of the machine makes it ideal for most small and large leather projects. With the CB4500 if the stitch length gets shorter when going from thin material to thick material, what's the reason of this problem? Yes, with all compound feed machines when you go from a thin piece of material to thicker layers of material the machine will make a smaller stitch. The reason for this is simple. The needle bar moves up and but also swings front to back like a pendulum. If you can imagine the swinging motion of a pendulum you will see that the higher up the pendulum you go the shorter the distance of motion for the line. The same holds true for the compound feed sewing machine. Thicker layers of leather go higher up the needle, and the distance of swing higher up the needle is less than the distance of swing further down on the needle. So thicker layers of leather will make a smaller stitch. There is no fix for this problem other than adjusting the stitch lever down to create a bigger stitch when sewing on the heavier leather. Which CowBoy leather stitching machine can obtain perfect sewing quality that same to hand sewn, the top stitch and bottom sttich look same? It is impossible for the top stitch to be the same as the bottom stitch on a any sewing machine except for a needle and awl machine when sewing leather. The reason for this is because when the needle leave the back of the material, there will be an exit wound that is made in the leather, much as if you shot a person with a gun or shot a board with a gun. The stitch will look a little different on the back side. One of the things that you can do to somewhat eliminate this problem is to cut a sticth groove on the backside of the leather as well as the front side of the leather. This will allow the stitch to sink down below the leather a little bit better. The needle and awl sewing machines such as the Union Lockstitch and Campbell Randall machines deliver a hand sewn look because the awl punches the hole first then the needle shoves thread into hole. However, most people don't use these machines now because they are only made to sew leather. They cannot sew anything else. I am missing stitches when sewing leather with my CowBoy CB4500, what should I do? If you are missing stitches (skipping stitches), please check to make sure that you have the correct needle size for the size thread which you are using. If you have found that your needle size and thread are correct, try turning your needle to the left or to the right a couple of degrees. If you are still missing stitches, you should adjust the timing of machine (you can find detained instruction in the CB4500 manual). Why the needle hole makes look so sloppy on the bottom side of vegetable leather? For exit of needle, if they switch over to a diamond point needle it may help some. The diamond point needle allows for cleaner stitch on bottom. Schmetz S point needles good for softer leathers, but diamond point works better for hard or dry leathers. Organ makes them in Diamond point that cause the stitches to sink into the holes on the front and back, reducing the apparent stitch length (to the eye). I am the owner of DIY leather workshop, and looking for a good leather sewing machine for expanding my business. Your leather stitching machine can work with waxed thread? Waxed thread is a poor choice for staight needle leather sewing machine like CB4500 and CB3200. It is not strong enough to survive sewing in a straight needle sewing machine. It works well in needle and awl machine where awl punches hole first, then needle stuffs thread down hole. But it does not work well in straight needle sewing machines. They have polyester and nylon threads that look similar to waxed thread. It is an off white color. It is best if you uses that. I mainly use vegetable tanned leather which will be marked by the grip on a regular plate and feed dog. Which leather stitcher can resolve it? Both CB3200, CB3500 and CB4500 leather sewing machines come with Non-teeth feed dog, smooth throat plate and Smooth bottom leather sewing feet. These parts can avoid marks when sewing leather goods and upholstery.